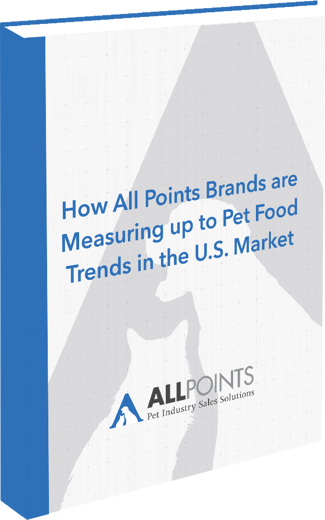 Find out how All Points Brands measure up to top Pet Food Trends in the U.S.
...but that doesn't mean you or your vendors shouldn't be able to stay on top of them. What consumers want to feed their pets today versus 20 years ago has completely shifted. Downloading this eBook will give you access to tons of valuable information which will help you make a decision when it comes to which pet foods to sell. Where is the U.S. pet food market today? How has sales in the U.S. pet specialty retail market shifted in the last five years? What are some of the top pet food trends in the U.S. market at this time? How do All Points brands match up to some of these top pet food trends?